I used to hate brussel sprouts. I didn’t just hate, I seriously loathed brussel sprouts. So one day I made some Maple Glazed Brussel Sprouts and they were amazing! So good that I ate the entire tray of brussel sprouts by myself. This brussel sprout hater had been conformed! So once I got the taste for roasted brussel sprouts, I decided to try new roasted brussel sprouts recipes. This is just another roasted brussel sprouts variation. This recipe for honey balsamic brussel sprouts couldn’t be easier to make. 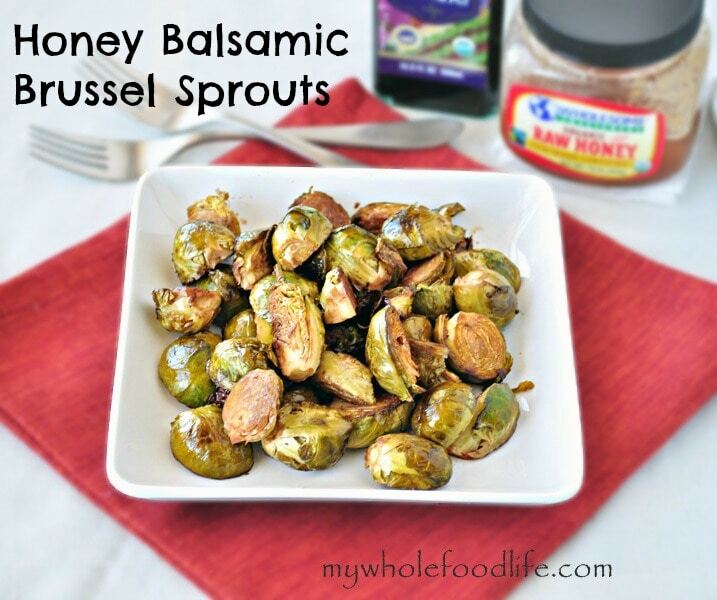 If you have a kid that claims to dislike brussel sprouts, you may want to try this recipe. It’s seriously good! These Honey Balsamic Brussel Sprouts would be a great side to almost any meal. This might be the recipe to convince your kids to eat their sprouts! Remove ends, cut in halves and throw in a bowl. In a small bowl , whisk together the ingredients for the dressing. Pour the dressing over the brussel sprouts and mix until all are coated. Lay the brussel sprouts on a lined baking sheet . Bake for about 30 minutes, stopping halfway to flip the brussel sprouts. It seems to me that everyone has been raving about brussel sprouts lately and I have always loathed them also. They taste like hair spray to me. :P But this does sound delicious so I will have to finally break down and try them! :D Thanks! I love brussel sprouts, usually just have them roasted in olive oïl, salt and Pepper. But will definitely give this a try, sounds yummy! Thanks! I hope you enjoy this recipe. I added some butternut squash to mine...in the oven as I type. Might need more dressing next time. I bet butternut squash goes well. I got some Brussel sprouts in my bountiful basket this past week and I have never eaten them before and so I've been scared to make them. This post couldn't have come at a better time! Trying this recipe tonight! Thanks!! AMAZING!!! Definitely the most delicious Brussels Sprouts I've ever tasted. Thanks for sharing this recipe! I tried these tonight and they are delicious! I'm a brussels sprout convert. Yay! So glad you liked them! I am loving them lately. Awesome! I love brussel sprouts! How long do you think these would keep in the refrigerator if I made a batch! I'm excited to try them out! I think they would last a week at least.